We all introduced ourselves to each other at the departure gate for the flight bound for Kilimanjaro. There was an air of excitement as we headed off to the snows of Kilimanjaro and the greatest African plains – the Serengeti. W e were a small group of people drawn together through our love of big cats and all wildlife. We were slightly in awe of our hosts – professional naturalist Stephen Mills – a gentle giant and cross between Stephen Fry and Gerald Durrell but obviously immensely knowledgeable about all creatures great and small, and our main carer and co-host Liz Drake – a veteran traveller who was cool, calm and collected. It was clear from the onset that they had a good working rapport and a relaxed and confident air about them. Within minutes the teasing and laughter commenced and we realised we were in for a very special safari and in very safe and capable hands. Everyone in the party seemed very nice and harmonious – we all breathed a sigh of relief and from the moment we boarded the flight we started to enjoy ourselves. What we hadn’t anticipated was that we were in for the best safari ever. Every day there were wildlife highlights as Stephen seemed to find the best action out in the bush and was oozing enthusiasm and imparting so much minute detail about every species we saw. He was like a walking encyclopaedia with a boyish excitement that was highly infectious. We spent the first few days in Tarangire National Park – a bit of a hidden gem and a park with lots of wow factors. The landscape is stunning and the phenomenal wildlife encounters we experienced took us all by surprise. 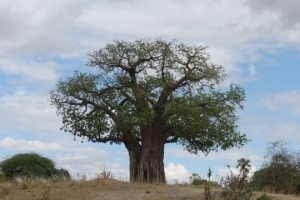 Tarangire has thousands of impressive ancient and beautiful baobab trees and massive herds of elephants. On day two we followed a beautiful leopard for a long time while it ambled along an adjacent track. It was clearly very intent on its destination and nothing was going to stop it in its tracks – that was until we suddenly saw a young bull elephant emerging from the bushes to our left who was purposely striding down to the lake and was taking a path that was heading straight for a collision with the leopard. We waited and watched in disbelieve as neither animal seemed to have seen each other. Suddenly the elephant spotted the leopard and when it was just a few feet away it trumpeted and charged. The leopard seemed to almost jump out of its skin and charged back. The elephant was not going to back off nor was the leopard. This was extraordinary behaviour. It was all over in a few minutes and they both went on their ways. Later we saw that the leopard had cubs hiding in the bush which is why she was so fixed on her destination. The young bull elephant simply wanted to go and join his family that we grazing in the lake and was taken by surprise when he bumped straight in to the leopard- this was a bold juvenile with attitude! 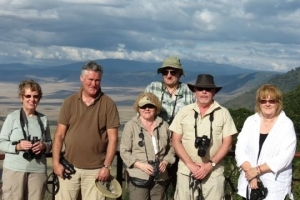 Our next stop was the Ngorongoro Crater where we decided to head out as early as possible to enjoy the Crater by ourselves. We breakfasted alone in a beautiful setting next to a lagoon, but soon realised that we weren’t actually alone. There were 2 lions sitting on the hill opposite watching us – how exciting. Then a herd of zebra moved in, oblivious to the presence of the lions. Now this was going to get really exciting. The lions split and were trying to separate the herd and sift out the weakest. The zebra just kept grazing and slowly moving on. The lions gradually moved in and we really thought we would not be the only ones enjoying a breakfast. But the lions were immature and inexperienced and we could see they were going to fail. Still it was excellent entertainment and the zebras had a lucky escape. We watched all this for a good hour without another vehicle insight – perfect! We spent most of the safari on the Serengeti Plains – the largest intact ecosystem left on earth. Its true boundaries are defined not by lines on maps but by the seasonal movement of millions of wildebeest, zebras and gazelles. Nowhere else can you observe the daily activities of such a variety and number of mammals – predators and prey. So many animals and so much behaviour for Stephen to interpret – he was in his element and we were not disappointed. Unusually large herds of buffalo were on the move, which was exciting enough but when they walked straight in to a large pride of lions things really hotted up. We sat and observed for hours the lions pushing the buffalo off their course and splitting the group. They worked relentlessly in pursuit of a kill. 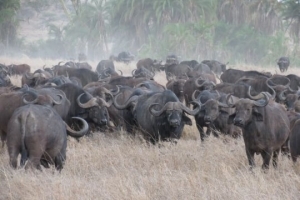 A buffalo is a Michelin star dinner for lions and here they had hundreds on their plate. The buffalo were strong and clever and held their ground. They persistently regrouped and formed a formidable mass against the lions. It was like watching a cowboy and Indian film. We were staying in an authentic bush camp where you could truly live by natures rhythms. It was small and simple – we were here for the wildlife and not our own creature comforts and wildlife we had plenty of – wandering through camp day and night. The camp seemed very small – dwarfed by the massive Serengeti plains and huge African skies. 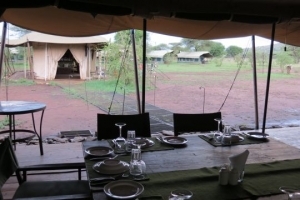 Hyenas skulked around our tents at night laughing and whooping – what a magical sound. 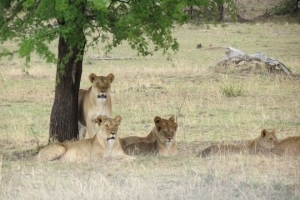 Lions roared close by – this could not get better surely. Then one evening just as we were finishing our supper we heard lion very close, in fact very very close – in camp itself……we knew there had been a couple of buffalo hanging around camp in the afternoon…..then there was a hush before a single grunt and it was all over for one buffalo. The kitchen staff were startled – pots & pans clanged as they went flying, as did the mess staff in panic. The kill had taken place in camp less than 100 yards from where we were sat eating our dinner. The adrenalin was pumping through our veins. Stephen could not believe how lucky we were – this was the wildest dream possible. The lions ate all through the night and were still feasting in the morning. Vultures, jackals and hyenas hung back waiting to go in for scraps. The next few nights were lively as the kill was feasted on by every animal in the bush. By the time we broke camp the kill was completely finished. The Serengeti was proving to be star-studded in terms of the number of species and the wildlife action we were seeing every day. There are lots of prides of lions in the Serengeti and one afternoon we came across a rather beautiful pride with some cubs. We were entertained by them for a long while but then, as lions do, they began to settle down for an afternoon siesta. Stephen is a big tease and he decided to call to the lions to see what reaction it created. Lions are fiercely territorial. His calls were so authentic the pride went into high alert and those that had wandered away ran back for security – they genuinely thought a lion from another pride was entering their territory. We’d had our fun and left the pride in peace. Much to our surprise and delight we had a rare but wonderful sighting of a group of Oryx – such majestic and shy creatures. Tommy’s are a cheetahs favourite meal and watching a kill is exhilarating and very exciting. One morning rumour had it there was a cheetah nearby in some swampy bushes. Several vehicles had gathered but no one could see the cheetah and they eventually gave up and left. With Stephen’s experience, knowledge and trained eyes for spotting, which requires skill and patience, and some good luck – suddenly he found her. Yes, there she was…. and there were some tommy’s within her range. She started to stalk and then went like lightening. A huge amount of energy is required to run as fast as cheetahs do but they cannot sustain it over long distances, so it’s all over in seconds. On this occasion it was all over for one tommy. 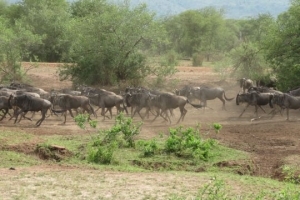 Finally we found the massive herds of wildebeest that were supposed to be in the Serengeti…..literally thousands – maybe 500,000 and what a wonderful sight and atmospheric sound. Then in the distance we could see the dust being stirred up and the pounding of hooves and we knew not far away a herd was summing up the courage to cross the river. As we neared one of nature’s greatest spectacles, the noise and dust increased. We sat and watched for ages as they surged backwards and forwards. It was totally riveting but as is so often the case they get spooked and lose their nerve and carry on moving on along the river bank. On our final morning and close to camp we came across a cheetah lying in an opening – such elegant and graceful creatures. It was early morning and animals were still active. 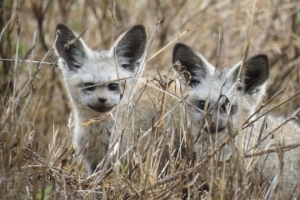 A bat-eared fox wandered into the scene – another gem of the plains. It was skirting around the cheetah when suddenly the cheetah decided to chase it. The chase was fast and exciting as only cheetahs do, but it became clear it was not to kill the bat-eared fox but to drive it away – absolutely extraordinary for a cheetah to burn off valuable energy not for a kill. Was this simply a case of getting out of bed on the wrong side? What more excitement and drama could we hope to see? Just before we left the Serengeti Plains we came across a pack of hyenas on the banks of a river. They had got a kill. We watched as new members came in to see what food was left. 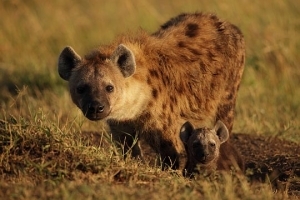 Hyenas are hugely vocal and the pack dynamics are absolutely riveting. The matriarch – a rather scruffy looking creature, was top dog and controlled the pack. Anyone not in favour was kicked out and had to wait and watch from the side lines as others feasted. Hyenas may not be the most beautiful of beasts but their behaviour is fascinating. There had been so many highlights – there had been something special every day and we had witnessed some extraordinary animal behaviour. We learnt so much – what makes an animal tick & behave in different ways. Stephen interpreted behaviour not only in the context of its ecosystem and physiology but also how an animal thinks, rather than assume it thinks like us. We got the bigger picture and the whole picture on animal behaviour. Thank you Africa, for a star-studded safari. Thank you Stephen, for sharing your wildlife knowledge with us and making it all such fun. Thank you Liz for organising such a seamless safari and looking after us all so well. 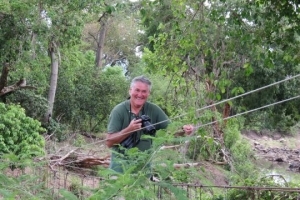 You can join Stephen Mills in September when he heads off to Rwanda and Uganda for close encounters with Mountain gorillas or in November when he’s back in India tracking tigers.